Ikachan is a perfect snack-sized game. Coming in at around two hours, it offers a concentrated dose of pure Studio Pixel exploration. A precursor to Cave Story, It's the same kind of lovingly pixelated subterranean environments, the same kind of mysterious, mute protagonist dropped into a society in the midst of a power struggle, and the same kind of discovery of previously inaccessible spaces via new abilities that Pixel perfected in Cave Story, but in a miniature form you can enjoy start-to-finish in a single sitting. With a cute lil' squid as the hero. Ikachan, a tiny, mute white squid, arrives in a small network of caves with no idea how it got there or what it's doing. In short order, it discovers that it's in the domain of Ironhead, a literal big fish who tightly controls the food supply for the surrounding sea creatures, raiding the storage locker and preventing all the poor little fishies from getting their fair share. At first, your abilities are limited to swimming around. Then, you find a pointy hat that lets you attack, which you can then use to defeat various aquatic beings and gain experience, eventually adding to your HP. The extra HP is useful to help you navigate dangerous spike-filled corridors in search of more abilities and more answers as to what's going on. But you never find too much of either, due to the brevity of the experience. Ikachan tells a small story, centered around one small underwater cave, and it has a small repertoire of mechanics. It never expands into the wider experience, or introduces newer, bigger threats, like other games of its genre might. The only perceived threat at the beginning is Ironhead, and Ironhead remains at the top of the food chain (literally and metaphorically) throughout. Whether the miniature runtime is a disappointment or a boon will largely depend on your expectations, and perhaps the pace of your life. Ikachan has no extra content or New Game Plus to pad out the cozy little story. I was surprised when I arrived at the end, sure it was just going to be a chapter transition. For me, that surprise was welcome. It was a movie-length game. It didn't really need to continue, and I got the satisfaction of a complete story in between all the other things I had to do that day. 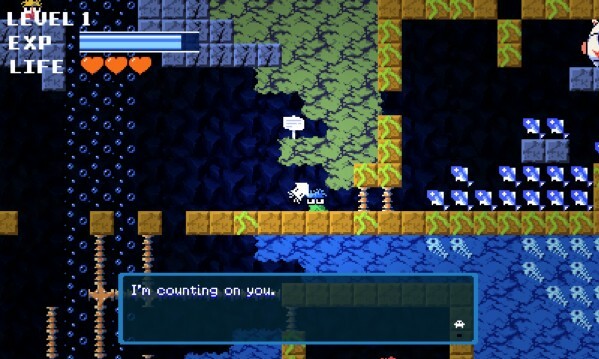 And just like any other game of the Cave Story/Metroid genre, I can and will just play it again. This Portabliss is based on a 3DS download of Ikachan, available tomorrow. A DSiWare version is also planned.